The beauty of sculpture is that it needs to be viewed from all angles to be truly appreciated. Lights and shadows will transform the sculpture in your home or garden throughout the day, making it feel new and fresh from one moment to another. The wide open space at DIMENSIONS 2018 allows you to walk around each sculpture freely. Examine and pay attention to the subtle nuances of texture and shape from the different angles. An example is Theo Burtick’s Infinity. It’s meant to look like a completely different sculpture depending on where you stand. From the back to the front it changes from a “0” to the Infinity sign. As you move around the floor, don’t forget to look up! Maria Saracino’s whimsical yet realistic characters will put a smile on your face as they float from the ceiling. DIMENSIONS 2018, October 12-14 at Lansdowne Park in the Horticulture Building. Join us for our ‘Octoberfest” opening reception on Friday October 12 from 6 to 9pm. Or make it a day at Lansdowne on Saturday, October 13th – the doors are open from 10am to 9pm – Art, free stone carving workshop, shopping, dinner and a movie. What could be more perfect! Your last chance until next year, come visit on Sunday, October 14th during the Farmer’s Market hours from 10am to 5pm. If you ever shied away from sculptures for your home because you feel it takes up too much floor space, think again. There is a wide variety of hanging wall sculptures made from a range of materials and mediums. A wall sculpture will add depth and texture that 2 dimensional paintings cannot. When choosing a wall sculpture consider its weight and size and the wall you have planned for it. Is the wall plaster, drywall or wood? Is it cement or metal? Is your piece made of lightweight materials? Depending on the medium of the sculpture, you will it need to be supported for its inherent weight? With a little research you can easily hang a lightweight or heavy sculpture on your wall. The right sculpture can transform a room. Whether you are looking for something that will relax or invigorate your living space, wall sculptures are a wonderful choice. Think of a wall sculpture as a painting that delivers so much more. DIMENSIONS 2018 is the largest collection of sculptures in a single exhibit in the Ottawa area with over 100 sculptures in a variety of mediums by renowned local artists. The 20th Annual Exhibit is taking place October 12-14 at Lansdowne Park in the Horticulture Building. FREE ADMISSION! While you are there don’t forget to check out our gift shop where a portion of the proceeds goes to support the Boys and Girls Club of Ottawa. Our 20th annual sculpture exhibit is two weeks away and we’re looking forward to showing you what we’ve been working on for the last 12 months. Friday, October 12th we are opening the doors at 6pm for our “Octoberfest” Vernissage. Come enjoy a few refreshments, meet the artists and their creations and watch Ephemeral artist, James Cook sculpt and carve a giant pumpkin. Saturday, October 13th DIMENSIONS 2018 will be open from 10am to 9pm. Admission is free and so is the stone carving workshop at 2pm. Learn how to shape, sand and polish soapstone into a beautiful pendant. This free workshop runs from 2pm to 4pm. Sunday, October 14th is your last chance to see this extraordinary work. 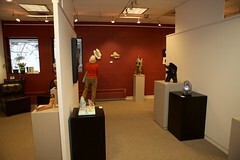 The exhibit runs from 10am to 5pm and many of the artists will be on hand. Don’t forget to participate in Sheree Bradford-Lea’s Interactive sculptures, “Keep An Eye on Your Mother” and “First Date”. It’s fun and thought provoking, and Sheree is on hand to tell you all about it. Before you leave check out our Gift Boutique where part of the proceeds go to help the Boys and Girls Club of Ottawa. Everything in the Boutique area is priced under $100 – here’s a great opportunity to get a head start on your holiday shopping with some unique and creative gifts. DIMENSIONS 2018, Friday, October 12th – Sunday, October 14th. See you then! Three-dimensional and difficult to ignore, sculptures are one of the best types of art to add a neat design element to your home. However, their size can sometimes make it difficult for people to know exactly where to place them so that they are on display in the home without taking over the space. A really terrific way to showcase sculptures without worrying that they’re taking up too much room in your home is to set them inside niches in the wall. You can even add lighting within the niche to truly show off the piece that you’ve placed there. The National Capital Network of Sculptors is excited to present their feature exhibit DIMENSIONS 2018. It’s a great place to find the perfect sculpture for a little niche or a larger, stand alone masterpiece for a bolder statement. Visit us between October 12-14th in the Horticulture Building at Lansdowne Park in Ottawa – over 100 sculptures will be part of the exhibit. We have extended hours on Saturday, October 13th and will be open from 10am to 9pm. FREE ADMISSION and wheelchair accessible. We’re in our 20th year, but just in case you haven’t heard about us, DIMENSIONS is an annual “sculpture only” exhibit by the National Capital Network of Sculptors – right here in Ottawa! Planning starts a year ahead and there is a lot of behind the scenes coordination involved. From building and painting the wood pedestals to planning and laying out the floor plan. 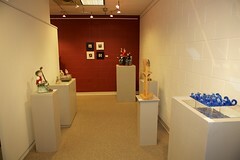 The artists work in a variety of mediums from stone, wood and metal, to clay, glass and mixed media. They spend a full year creating new pieces for the exhibit. The result is a top quality, museum style exhibition that’s FREE to the public! The Horticulture Building at Lansdowne Park is the perfect venue with its high ceilings, lots of natural light and easy accessibility. Participate in a stone carving workshop on Saturday afternoon – best of all, there’s no charge if you want to take part. 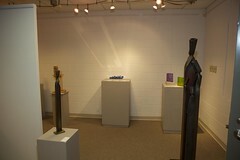 This year there are 24 artists showing over 100 sculptures. 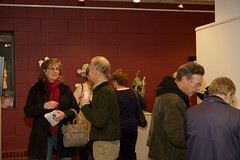 Come meet the artists, get a close-up look at some amazing sculptures and support your local art community. You can also help support our local Boys and Girls Club by getting a head start on your holiday shopping in our cozy little Gift Shop. Pop in for a quick peak or stay for as long as you like, there’s something for everyone. Opening night is Friday, October 12th from 6 to 9pm. Enjoy our Octoberfest reception, meet the artists and enjoy the world premiere of some amazing sculptures. We’re open all day Saturday, October 13th, from 10am to 9pm – make it a date night and have dinner at one of the great restaurants in the Lansdowne Park area. On Sunday, October 14th we’re open from 10am to 5pm along with our Farmer’s Market neighbours. Mark your calendars and we will see you in October! We’re 6 weeks away from DIMENSIONS 2018, and we are in full force planning for our annual feature exhibit. More information will come over the next few weeks but in the meantime add us to your list of things to see and do in October. Our artists have been busy creating some new spectacular sculptures and we’re looking forward to seeing you soon. The exhibition Plant Portraits: Native Plants of Canada at the Canada Agriculture and Food Museum is an impressive collection of modern, botanical art. Through more than 30 original artworks – in watercolour, graphite, and mixed media – the exhibition examines our native plants as seen through the eyes of artists. 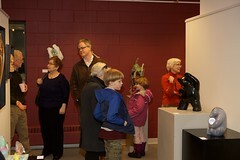 The exhibition includes a commissioned sculpture from NCNS sculptor Rosemary Breault-Landry. The exhibition runs from May 18 to October 31. Drag the pointer on the map to select one of the numbers identifying an artist/studio and click on that point for more details. The wheel of your mouse will allow you to enlarge / shrink. May 5th & 6th . . .
10:00am to 5:00pm . 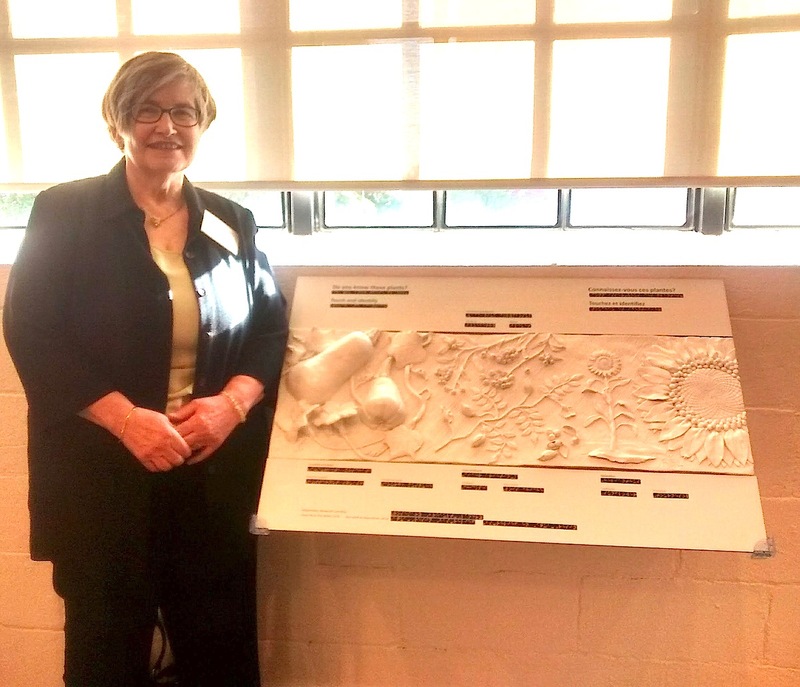 . .
Every time you v isit one of the stops on the Sculpture Studio Tour this weekend, you can enter our draw for a chance to win an original ceramic sculpture by NCNS artist, Sandra Marshall. You can see the prize in person at Stop #1 on the tour. The winner of the ceramic mustang on a plexiglass base will be drawn on Tuesday, May 29th. Enter the draw up to nine times by visiting all the stops on the studio tour! MARK YOUR CALENDARS . . . . . . . IT’S THIS WEEKEND! 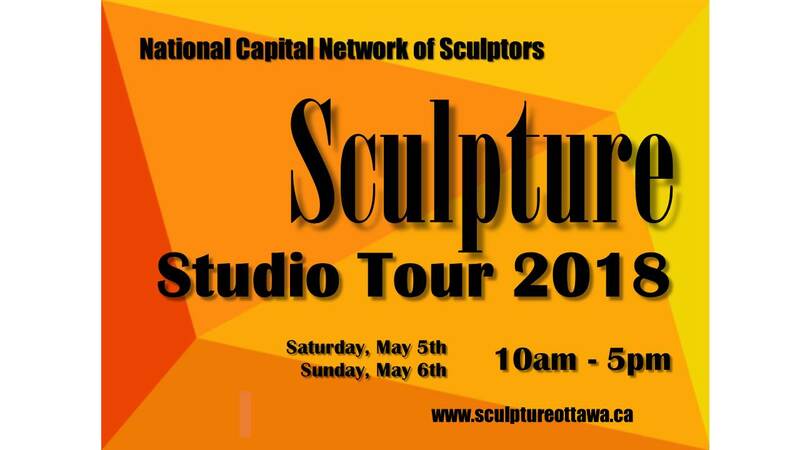 Here’s a look at what you can expect at the 2nd Annual Sculpture Studio Tour – May 5 and 6th . . . . . Remember . . . 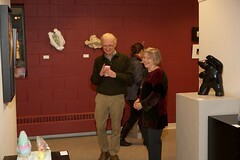 The more stops you visit the more chances you have to win an original sculpture by Sandra Marshall. The studios are open from 10am to 5pm. 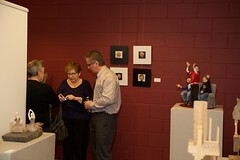 STOP #1 – Sandra Marshall at Galerie Côté, 98 Richmond Road in Westboro. At this stop you will see some of Sandra’s human and animal ceramic creations. Not only will Sandra be demonstrating, but she will be giving you a chance to try this medium yourself. Don’t forget to enter our draw from one of Sandra’s beautiful sculptures – The Mustang Ceramic on Plexiglass. STOP #2 – Alpine Clayworks is located at 1200 Alpine Avenue in Ottawa’s west end. For clay sculptor, Art Petch, it’s all about shapes and colour, often a narrative in nature. From extruded to hand-built pieces the sculptures are mesmerizing. Increasingly, decals are an important part of his work in that they support the narrative aspects. STOP #3 – The newly opened Hello Studios is host to the Polymer Clay Artists this weekend. 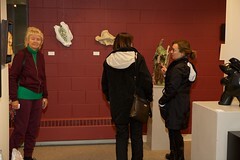 Maria Saracino and Line Labrecque will be showcasing the possibilities of poymer clay in the art world. Watch or take part in a workshop or shop for Mother’s Day from the large assortment of gift items priced under $50. Hello Studios is located at 1735 Courtwood Crescent – the entrance is at the back off Woodward Drive. STOP #4 – Heading east, Hengameh Studio is a brand new location on our tour where ceramic artist Hengameh Kamal-Rad opens her doors to the emotion and movement of her ceramic works. Guest artist Kathy Bergquist joins her with a collection of works created from metal and found materials. You can find Hengameh and Kathy at 2222 Saunderson Drive. STOP #5 – A little further east and you’ll arrive at our biggest stop on the tour, Smith and Barber Sculpture Atelier located at 1520 Triole Street. Stone sculptors Danny Barber and John-Phillipe Smith are hosting 5 additional guest artists. Stone sculptors Patrick Imai and Terry W. Schaub; Ceramic artist Colette Beardall; Fibre artist Christine Mockett and Ephemeral artist James W. Cook. There will be demonstrations and hands-on experiences where you can make a beautiful stone pendant. Sign up for workshops or find a treasure for your home or garden. STOP #6 – In the heart of Sandy Hill, Worldview Studio artists, Janet MacKay and Mitchell Webster will showcase their beautiful cast bronze and stone sculptures surrounded by some of Janet’s amazing paintings. Guest artists, ceramic sculptor Taunyee Robbins and metal and recycled artist, Tick Tock Tom make this a very interesting stop on our tour. You can find Worldview Studio at 210 Blackburn Avenue. Then it’s time to cross the river and head over to La Belle Province. We have three studio stops starting with . 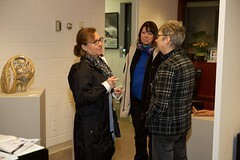 . .
STOP #7 – Meet Rosemary Breault-Landry and Dominique Dennery – Bronze, hydrostone and hydrocal artists working out of the RoseDen Studio at 35 rue de Villebois in Gatineau. Influenced by the human condition, history, myths and legends, these artists are looking forward to showing you the drawing and clay sculptures that take their art from real people to three-dimensional sculptures. STOP #8 – La Fab Studio is home base for Uwe Foehring’s stone and cement sculptures. Located at 212 Old Chelsea Road, this studio is right in the heart of charming and picturesque Chelsea in the Gatineau Hills. Self taught, Uwe takes his inspiration from nature, animals, politics and injustice. Watch as he coaxes the shape of the stones in his unique and emotional process. 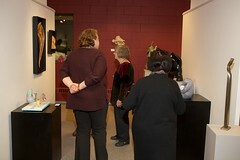 STOP #9 – Not far is the last, but not least stop in the Sculpture Studio Tour. Theo Burtick, citizen artist and sculptor welcomes you to Chelsea Sculpture Studio located at 54 chemin Belle-Terre. Theo is a visual artist working in traditional mediums of stone and metal to create work that physically engages the viewer and provokes thought.